I was a Sub-Lieutenant RNVR in LST (Landing Ship Tank) 238 during the Normandy operation, acting as a watch-keeper and the gunnery officer. Yes, we did have guns, not perhaps quite like a battleship but nevertheless six light anti-aircraft guns, which we did use, and one anti-submarine gun, which I regretted that I was not given the opportunity of trying out in anger to test my skills at directing. We arrived back in England from the Far East in February 1944 in time for the exercises. My memory of the last of these was that it was apparently a disaster. I believe that the follow-up troops were put ashore ahead of the initial assault forces, and then the RAF came in late and bombed our own men instead of ‘the enemy’. However, in the theatre world there is a saying that a poor dress rehearsal presages a good first night and so it was to prove. In the days before D-Day we were moored off Ryde, Isle of Wight, and the number of ships and craft of all descriptions multiplied. When they were loaded and sealed, the invasion was clearly imminent. The one day’s delay because of the weather seemed an eternity and any further delay would have been a disaster with changing tide times et al. My vivid memory of that final day was the sound of hymns, like ‘For those in peril on the Sea’, being sung with fervour from ship after ship as a padre made his way around the anchorage. 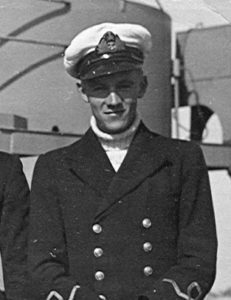 However, on the evening of 5 June we weighed anchor and set sail, forming up in convoy – it was on. We arrived off JUNO beach with our complement of Canadian friends at H + 3, i.e. three hours after the initial assault. The army on this sector had already advanced significantly, but the houses along the front were still blazing. We were inevitably held up for a while as the beaches had to be cleared of mines and obstacles, and there was then the problem of the tides. In the early evening the skies cleared and we watched large numbers of parachutes descending close to the front line, being of different colours to denote men, food, ammunition or medical supplies, and all the while a rumble of gunfire. On our radio we heard the King speaking to the nation so our families now knew that the invasion was on and that we were there, wherever. Once it was dark the odd enemy aircraft came over and then there was a splendid pyrotechnic display from the multitude of ships, to which we contributed. From a personal point of view, it was very much easier than the D-Day at Salerno the year before. In Italy then the Luftwaffe had air superiority and the troops were pinned down on or near the beaches for a week or ten days. In Normandy our soldiers were several miles inland by nightfall and we had overwhelming air superiority. We sailed back to England the following morning. Thereafter it was backwards and forwards between various ports in England and each of the beaches, both on the American and our own sectors, taking troops across and returning either with our wounded or with prisoners. In our group of LSTs we had an unofficial Blue Ribbon on which of us made the most crossings and we were among the leaders until we encountered an unexpected hazard. On one of our beachings we must have run in over some heavy metal object sticking out of the sand below the waterline, perhaps an anchor or part of a tank. It created a rent about ninety feet long in our flat bottom, which clearly affected our trim for future beachings. Instead of docking us immediately for repairs, there was apparently the need for a ship to be located in the Mulberry Harbour at Arromanches to act as a depot ship to a flotilla of our MTBs (motor torpedo boats), and we were assigned to this role. While it was interesting to see all the activity in this prefabricated harbour, the size of Dover and built on a former enemy beach in just a month, there was, in fact, little for us to do. I did, however, befriend the commanding officer of one of the MTBs, who invited me to join them on one or two of their night patrols. Their quarry were the German explosive motorboats. These were small fast boats with a massive charge in the bows and a pilot who would steer it onto a ship, rolling backwards into the sea before the impact. They were hard to spot in the dark until quite close and then, if hit, they blew up like a mine. On one night the flotilla dispatched six of them, of which our score was two. The hairiest moment was when we got into the crossfire of another MTB – not good. We were still in the Mulberry Harbour at the point when Paris fell to the Allies and, with our still having little to do, I asked the Captain, Lieutenant-Commander Cunningham, if it would be all right if I got lost for two or three days. With a twinkle in his eye, he said, ‘I don’t mind, Guns, if you get lost forever. Off you go, no questions asked.’ So I thumbed a lift eastward on a variety of army lorries, armoured cars and motorcycles and finally, on the back of an open lorry, reached Paris just a few days after its liberation. There were still crowds lining the streets, cheering and throwing flowers. What a wonderful way to experience this great city for the first time. I must have been one of the first naval officers to have arrived there judging by the interest shown but, after a day and night there, it was time to return by the same assortment of military vehicles to the ship. The officers of LST 238 in 1943. From left, Sampson the Engineer, Dallas the First Lieutenant, Cunningham the Captain, Giles the Navigating Officer and myself as Gunnery Officer.